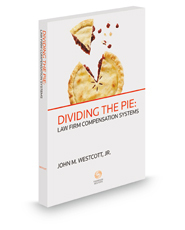 In Dividing the Pie: Law Firm Compensation Systems, Jay Westcott examines the ways law firms of all sizes compensate partners, associates, and support staff. He reviews the pros and cons of various compensation-setting systems and philosophies, and he gives practical advice about how a law firm can reinforce the economic success and the values of the firm through compensation. He uses a case study to illustrate the many issues that arise in setting compensation in a law firm and to suggest possible solutions. Compensation disputes among partners can seriously impede the functioning of a law firm and lead to rifts and divisions which threaten the existence of some firms. On the other hand, adept handling of compensation can enhance the development of lawyers, contribute to the economic success of a law firm, and support the values and objectives of the firm.